Māori and Pākehā from around the country converged on Manukorihi Pā in Waitara, Taranaki, to attend the unveiling of a memorial to ‘one of New Zealand’s greatest men’, Sir Māui Pōmare, of Ngāti Mutunga and Ngāti Toa. The first Māori medical graduate, Pōmare had been a health reformer and Cabinet minister. During the ceremony, the governor-general, Lord Galway, unveiled an imposing white Sicilian marble statue of Pōmare, and a beautiful newly carved wharenui (meeting house). The statue, created by Christchurch sculptor W.T. Trethewey, depicts Pōmare delivering an oration. The students of the School of Maori Art at Rotorua had carved the wharenui under the supervision of Sir Āpirana Ngata. Also in attendance were nearly 40 Members of Parliament, including Prime Minister Michael Joseph Savage and two of his predecessors, J.G. Coates and G.W. Forbes. All three men spoke at the hui (gathering). Other important guests included the Māori King, Korokī Te Rata Mahuta, who travelled with a large contingent from Waikato and King Country to help open the new meeting house. 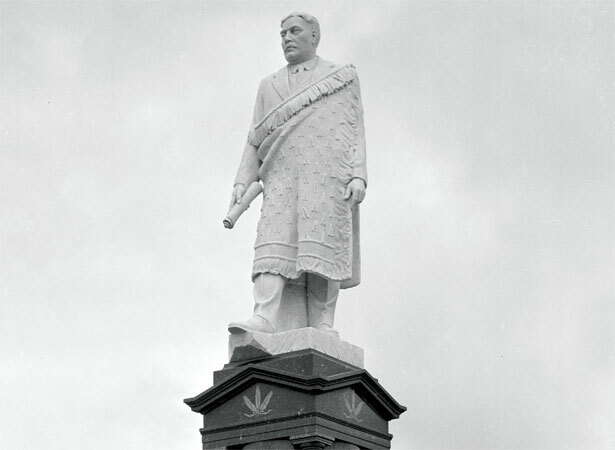 We have 6 biographies, 5 articles, related to Māui Pōmare memorial unveiled .